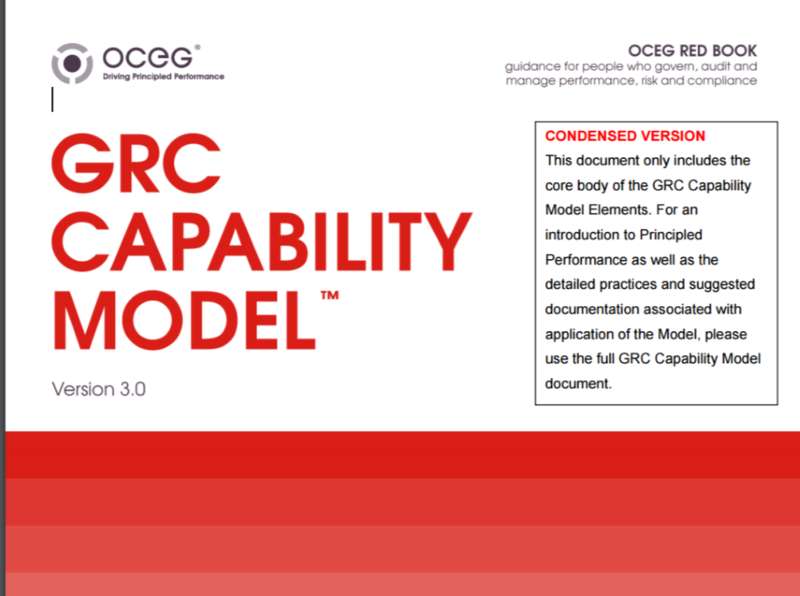 This document is a condensed version of the GRC Capability Model v3.0 (Condensed Red Book). This version contains the Elements and high level Practices of the GRC Capability Model. It does not contain the Narrative Introduction to Principled Performance and GRC, nor does it contain the Appendices that provide the details for each Practice (sub-practices) and suggested Documentation to be developed when applying the Model. These important parts of the Model are provided in the full GRC Capability Model. You will find this condensed version of the Model useful to gain a quick understanding of its structure and content. One last step before we send your standard! We have emailed instructions to access GRC Capability Model (Condensed Red Book) CONDENSED VERSION to . Make sure the email arrives in your inbox: either add "support@oceg.org" as a safe sender to your email platform, or if you use Gmail, drag our email into your Primary tab.